After his eighth album, Cosey started working on ‘A la recherche de Peter Pan’. But then, the album Kate had an enormous success and won the ‘Alfred’ for Best Album at Angoulême: publisher Lombard wanted a new Jonathan album. 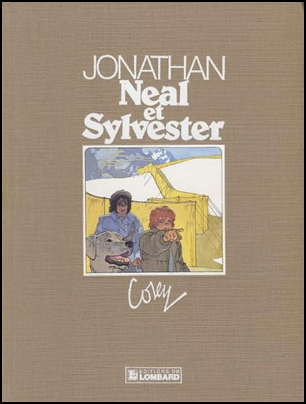 With the album ‘Neal et Sylvester’, Cosey leaves the colouring to Fraymond, a colourist he knew from the work done for Hermann. Cosey has to admit that it was also a question of time and delays. 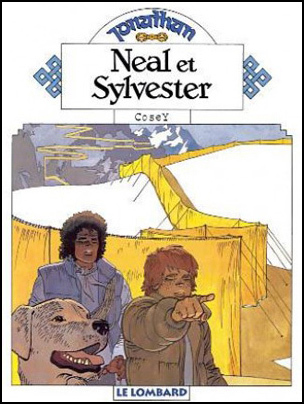 The cooperation with a colourist was continued in the next two Jonathans, when Paûle Ceppi was Cosey’s colorist. The artist Slivno, the father of Neal, was modeled on the Bulgarian artist Christo, known for his wrapping of the Pont Neuf in Paris and the Reichstag in Berlin. 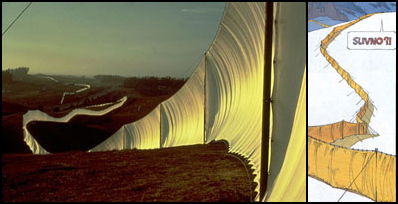 The work of art Slivno makes in the book was inspired on Christo’s work ‘Running Fence’. Christo’s Running Fence; Slivno’s work in Nepal. 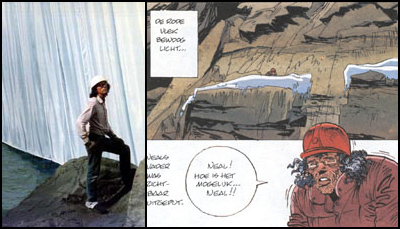 Christo at work at ‘Running Fence’; Slivno in the Himalayas.